In our september newsletter we focus on two interesing niches of sticker printing. Fuse blocks, industrial machines and many more installations need periodical maintainance. Machine specs are listed or maintainance is documented by little metallic labels that are applied to the device's case. 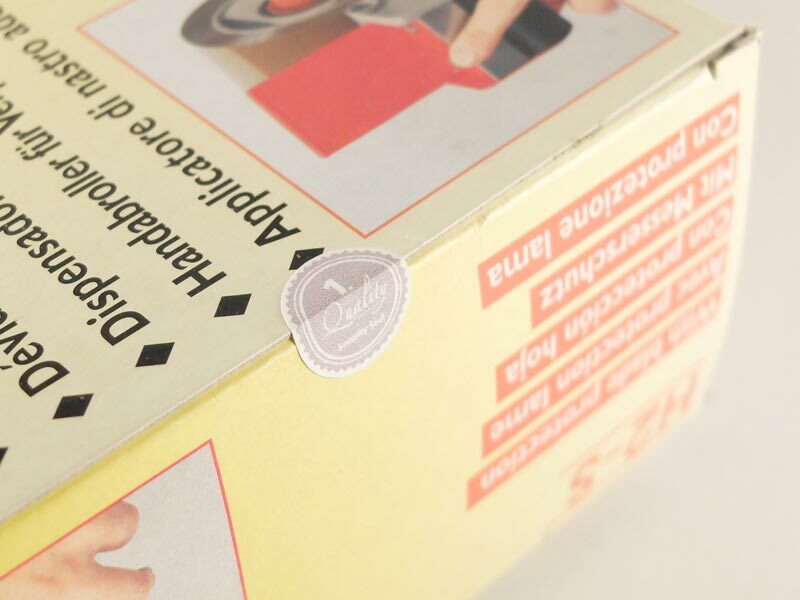 Another advanced use of stickers is for sealing product boxes or shipments, which is done by special security foils or papers. Metallic labels are, in most cases, a special case of vinyl. They are available at low price and can be printed in low quantities starting from 1pcs. Equipped with a powerfull permanent adhesive they last 4 years and more, depending on environment conditions and use scenario. The material is wipeable and resists water, alcohols and most detergents. Contact with oils, grease or benzine can be a problem, because they affect the sticker along the edges. An additional lamination or special covering can be a solution. Another type are metallized papers or oder pure aluminium labels. The latter can also resist high temperatures and corrosion. SIlkscreen printing is recommended for these scenarios, so the print can tackle the mechanical or thermal stress the material already resists. However, for high quantities, also offset and flexoprint offer solutions for such specific requirements. Usually the surface is covered with a thin vinyl layer to give hold to the pigments during printing. Almost every metallic material is available either with a glossy and a matte surface. Since the surface of metallic labels is not white, it will influence the color of the pigments. This can be an advantage, because the metallic material gives a shiny effect to non-opaque printing colors and an create additional attention for your brand. Combined with a black masking (see sample image below) the material can save you an expensive spot color. Warranty and quality checks often depend on whether a device was unpacked or a case was opened or not. But also vignettes for toll collection and other value-related labels should not be removeable without notice or re-appliable. For that use, a wide range of security materials exist that are also printable. The most flexible technique is ecosolvent printing, because it allows low qunatitites, wide-formats and numbering or pagination. A complex design can provide additional security against copies or fake.labels. There are materials that, when removed, leave a sticky message ("warranty void" or "opened"). This is useful to mark an opened box or case, but the warning message might be hard to remove from certain surfaces. For maintainance, it might be useful to easily apply a new seal that only your service staff uses to mark professional maintainance on certain devices. A very agressive adhesive is combined with a thin, brittle but flexible material. 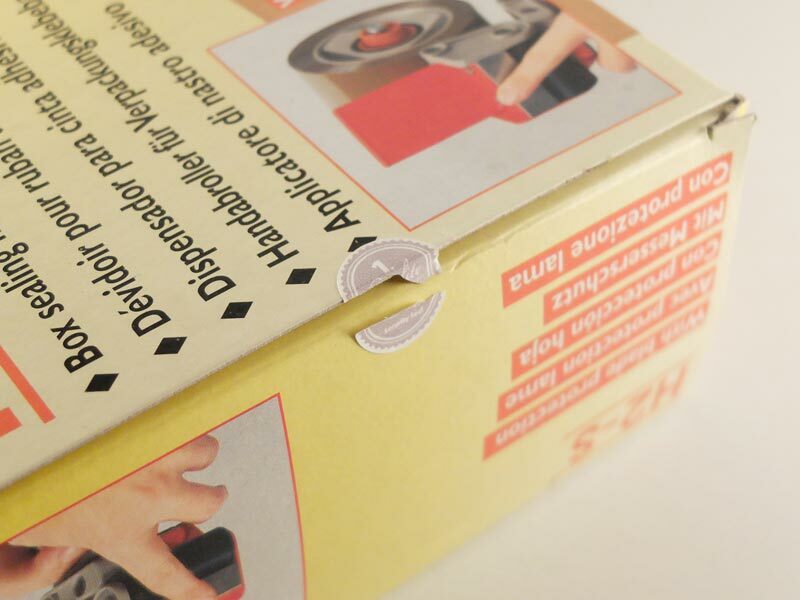 It is impossible to use these labels twice, applied on the right spot (of a box or case) any attempt to open it, will destroy the seal.